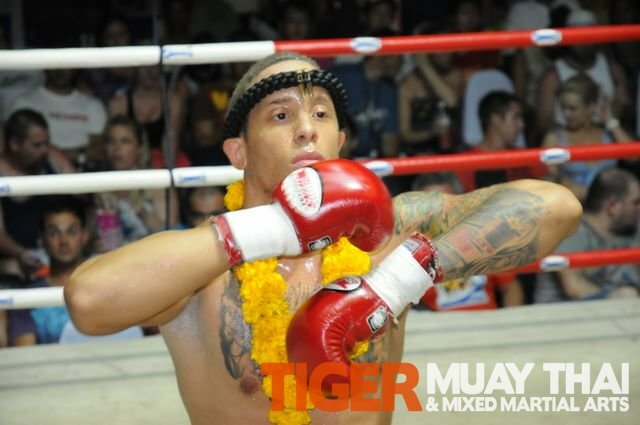 Congratulations to Tiger Muay Thai and MMA Phuket fighter Micah Terry on his recent performance in Germany. Originally told he was going to be competing in a 3×3 K1 style bout, Micah spent an extended training camp at Tiger Muay Thai focusing on a bout that would be conducted under those rules without the use of elbows. Arriving at the venue, the promotion informed Micah that he would be competing in ‘Full Rules Muay Thai’–which changed the bout from 3 rounds to 5, and added the legal use of the elbow strike. Always the game fighter, Micah accepted the rule change and put on a good performance. Competing on the undercard of the prestigious ‘Thailand Vs. Challenger’ promotion, Micah was awarded a very controversial ‘DRAW’ in a bout that many spectators felt he won unanimously. Next up for Micah is an October 22nd bout in Tubingen, Germany for the German ISKA Super Cruiser Weight Professional Muay Thai belt. The bout will be broadcast live on TV throughout Europe, and available for stream on the Internet. More details available soon.